The Hunter S. Thompson Shrine at Snowmass Mountain. Now off the chairlift, six new friends and I are on a mission: find the Hunter S. Thompson Shrine. We schuss the upper portion of Gunner’s View before ducking, single-file, into some glades at the trail’s western edge beside a telltale landmark: log remains of an elk stand used before this fourteener opened as a ski resort in 1967. One by one, we drop beneath the icy ridge, and bingo! Fear and Loathing… in the Colorado Rockies. The centerpiece is a crude log bench, surrounded by trees shellacked with laminated photographs of the Good Doctor and strung with gonzo ephemera: faded posters from Thompson’s run for Aspen sheriff in 1970, old golf shoes, an empty Chivas Regal bottle. There’s even a “book-lending library” in a yellow waterproof bag: a copy of The Great Shark Hunt, the author’s first volume of The Gonzo Papers. Admirers tack up news clippings, messages, beads and trinkets; bullets stud much of the tree bark—a not-so-subtle nod to Thompson’s penchant for firearms. Created in February 2006 on the one-year anniversary of Thompson’s suicide, this is one of the most elaborate shrines of all, maintained year-round by a faction of fans who call themselves GLUM: Glorious Leaders of the Underground Movement. 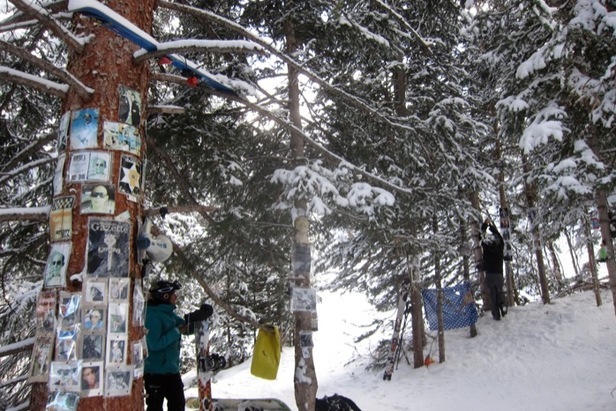 Can you find Elvis, John Denver & Hunter S. Thompson at Aspen/Snowmass?